May 8, 2010 By Eugene Nielsen & filed under All Articles, Gear. 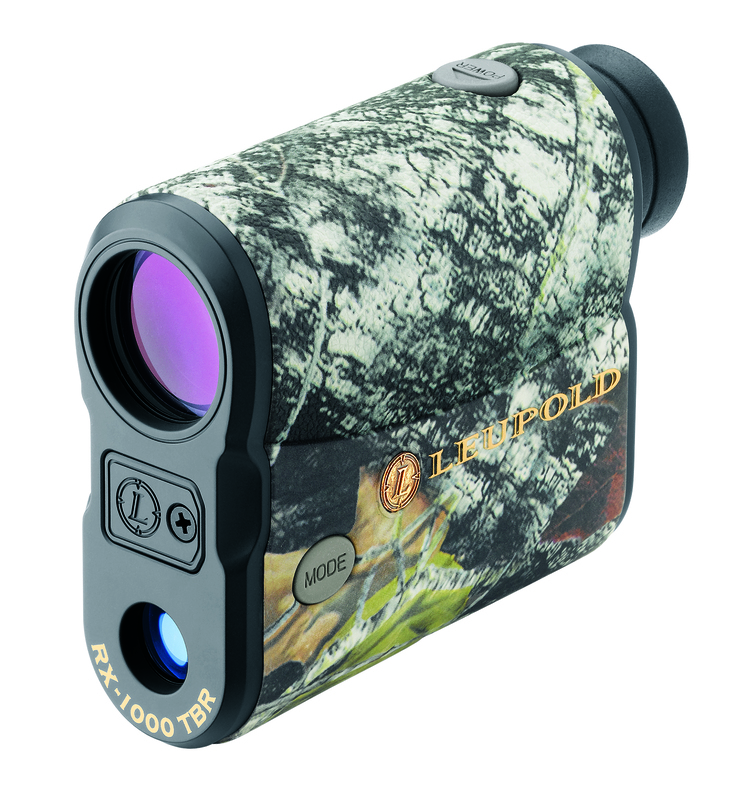 When Leupold came out with its revolutionary RX Series of “smart” digital laser rangefinders in 2004, they were a significant advancement in laser rangefinder technology. They offered multiple customizable functions that were not available in other rangefinders. What really caught my eye was Leupold’s True Ballistic Range (TBR) feature. Prior to the introduction of TBR by Leupold, all rangefinders were essentially no more than glorified tape measures (most of them still are). Other manufacturers have subsequently come out with their own “smart” rangefinders. 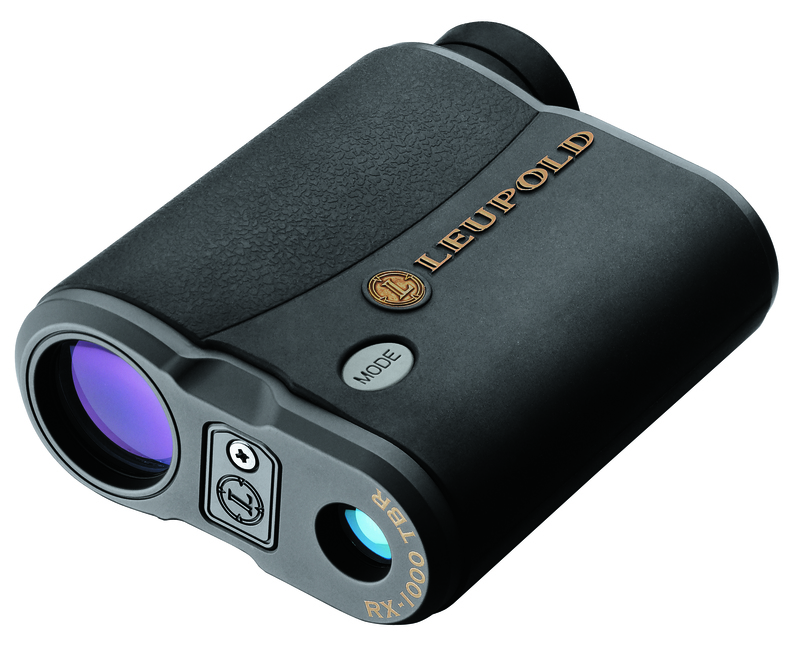 However, the Leupold RX Series TBR rangefinders remain the standard by which all others are compared. The new Leupold RX-1000 TBR continues that tradition. The TBR feature combines laser rangefinding with a sophisticated ballistic algorithm and a built-in inclinometer to automatically calculate the equivalent horizontal distance (level fire range) from which the shooter can determine the correct point of aim for precise shooting. Leupold RX-1000 TBR is available in your choice of black/gray or Mossy Oak Break-Up camo (shown). A rifle will always shoot high at an incline vis-à-vis the point of aim, whether you are shooting upward (called an elevation angle) or downward (called a depression angle), compared to where it shoots on a flat plane. The effect of gravity on a bullet is less during inclined fire, resulting in a flatter trajectory. In order to determine the correct point of aim, the shooter must know the bullet path. Bullet path and bullet drop aren’t the same thing. Bullet path is the distance between the line of sight and the bullet’s position at the slant range distance of the target. This becomes all the more critical at steep angles or long ranges. The old Rifleman’s Rule is only an approximation. In a tactical scenario or when you have the opportunity to bag the trophy buck of a lifetime, you cannot afford an approximation. Leupold TBR rangefinders provide accurate aiming information that’s matched to the ballistic performance of the rifle. The TBR algorithms utilized in the RX Series rangefinders were developed by the same engineers who developed the Sierra Infinity Exterior Ballistic Software. TBR is effective out to 800 yards for most rifle cartridges, with less than 1/2 minute-of-angle (MOA) error out to 500 yards. There are seven TBR rifle ballistic settings or groups from which to select, based on the sight-in distance, specific cartridge, bullet weight, and muzzle velocity. A group selection chart for most common cartridges is included in the operating instructions. Bow hunters will be happy to learn that the TBR mode has three bow groups, as well. The operator can choose from three different TBR readout options: HOLD (rifle only), MOA (rifle only), and BAS. HOLD will display the hold over (inches or centimeters) for the target at that distance. MOA will show the minute-of-angle adjustment based on the TBR. BAS will display the equivalent horizontal range and can be used with Leupold Ballistic Aiming System scope reticles. The RX-1000 TBR allows the operator to tailor the reticle to the terrain and target. The operator can select from three reticle choices as the primary aiming point (Plus Point, Duplex and Duplex with Plus Point). Other modes include a Last Target Mode (distance of farthest object when more than one object may be hit by the ranging beam) and LOS (Line of Sight—the straight distance to the target) ranging. The operator can choose distances in meters or yards. RX-1000 TBR is smaller and lighter than previous rangefinders. 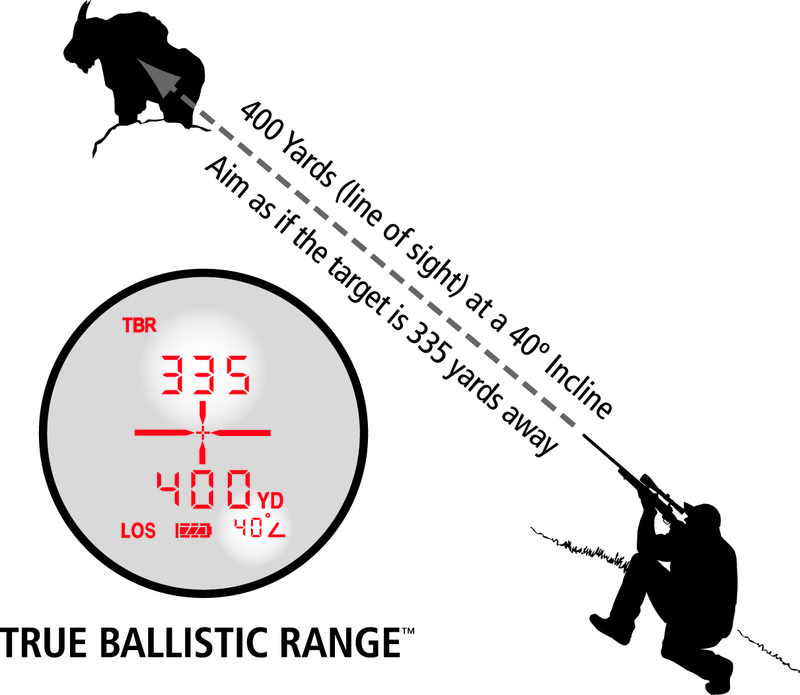 True Ballistic Range (TBR) provides accurate aiming information matched to your rifle or bow. Multiple modes can be selected and utilized in conjunction with the other modes for optimum performance under various field conditions and tactical situations. Activating some modes will automatically disable other modes to ensure proper ranging. Ease of operation has always been a hallmark of the RX Series. The RX-1000 TBR is no exception. All of the controls have been designed for easy one-handed operation. The function/menu display is the best that I’ve seen. The RX-1000 TBR features an updated Quick Set Rotary Menu with on-screen prompts. The Quick Set Rotary Menu gives you immediate access to all functions. There isn’t any need to scroll through multiple functions. When you press the Power button, the RX-1000 TBR is ready for scanning. To manipulate a function, press the Mode button, and the Quick Set Rotary Menu will appear. Press the Mode selector until that function is flashing. To set that function, simply press the Power button. If no other functions need to be set, the rangefinder will automatically power off after being idle for 20 seconds, saving all settings. If you need to manipulate additional functions, press the Mode button to continue through the Quick Set Menu. Pressing and holding the Mode button will exit the Quick Set Menu, save all changes and ready the rangefinder for immediate use. To reset the RX-1000 TBR to the factory settings, press the Power button to turn on the rangefinder, press and hold Mode, then press and hold Power. A countdown timer will appear and after 20 seconds the rangefinder will reset. The last range reading doesn’t have to be cleared before ranging a new target. Aim at the new target and press and hold the Power button until the new range appears. The RX-1000 TBR employs a vivid OLED (Organic Light Emitting Diode) display and reticle mounted within the optical system. It has three brightness settings. The OLED display and reticle provide sharp contrast for optimal readability in low-light conditions. It’s considerably brighter than LCD displays. It also uses less power, since there’s no need for back-lighting. When scanning, the RX-1000 TBR provides the operator with continuously updated readouts as the operator scans an area or tracks a moving target. If the target is behind an obstruction, the operator can quickly range on a nearby object. Ranging is accurate to +/- one yard/meter at all ranges. Leupold states that the RX-1000 TBR is accurate out to a maximum of 1,000 yards (914m) with a reflective target. Deer can be ranged out to 500 yards (471m) and trees to 600 yards (549m). My own testing validates these figures. Actual ranging capabilities will depend not only on the reflectivity of the target, but the environmental conditions as well. Any factor which degrades clarity or reflectivity will degrade performance. By calculating the incline, line of sight range to a target and a projectile’s ballistics, RX-1000 TBR provides equivalent horizontal distance for precise shooting. RX-1000 TBR has incredibly bright OLED display with multiple intensity settings for easy readability in all lighting conditions. Many variables affect the ranging performance of a laser rangefinder. These include lighting conditions; weather conditions; the surface texture, color, size and shape of the target; angle of incidence; and even the steadiness of the operator’s hand. Since the sun emits infrared, bright sunlight or ranging toward the sun can also degrade ranging performance. Power for the RX-1000 TBR is provided by a single CR2 lithium battery (included). Battery life is approximately 2,000 activations based on typical use. The RX-1000 TBR has a battery power status indicator in its display, so you always know how much power is remaining. The battery can be changed in seconds without tools. As is to be expected with a Leupold product, the optics on the RX-1000 TBR are excellent. Multi-coated optics are employed for maximum light transmission and a crisp picture. Leupold rangefinder optics provide 80% light transmission, over three times that of most other rangefinders. The RX-1000 TBR provided to me for evaluation produced a crisp, sharp image, although there was a little loss of resolution around the edges. I would put the optical quality of Leupold RX Series rangefinders, including the RX-1000 TBR, at the head of the pack when it comes to commercially available rangefinders. The RX-1000 TBR has 6X monocular magnification. The monocular has a wide field of view (320 feet at 1,000 yards). A wide field of view allows moving targets to be tracked more easily. The RX-1000 has a click-adjustment eyepiece focus system with precision one diopter clicks. The eyepiece has a rubber eyecup for comfort and to exclude extraneous light. The eyecup folds down for use with eyeglasses. Twilight factor is a number that’s used to evaluate the brightness of an image seen through binoculars or scopes used in low light. The larger the twilight factor, the more detail you can see in low light, all things being equal. Due to their compact size, the twilight factors of all the commercial rangefinders designed for shooters are comparable to those of compact binoculars, which aren’t ideal for observing detail in low-light conditions. For binoculars and scopes, a twilight factor of 17 or better is recommended for reasonable detail in low light. The twilight factor of the RX-1000 TBR is 11.5. The RX-1000 TBR is exceptionally compact and lightweight. It weighs only 7.8 ounces and measures 3.8×2.8×1.3 inches. The RX-1000 TBR has a rubber-armored, ergonomic body. It’s designed to be easy to grip under all field conditions. The body is machined from a billet of solid aerospace grade aluminum. The RX-1000 TBR is available with your choice of either a two-tone black/gray finish or a Mossy Oak Break-Up camo finish. Although some models of the RX Series are designed to be waterproof, the RX-1000 TBR is weatherproof, not waterproof. It should survive a rainstorm, but isn’t designed to take a dunking. The RX-1000 TBR is equipped with a black Cordura protective carrying case with flap closure. The flap features magnetic closure instead of snaps or a hook-and-loop fastener. The magnetic closure allows the case to be easily and silently opened and closed. There’s also a compartment for a spare battery. The case can be worn on a belt or clipped to load-bearing gear. If you are in the market for a compact rangefinder for either tactical or sporting use, the Leupold RX-1000 TBR is definitely worthy of your consideration. The RX-1000 TBR provides advanced features in an ultra-compact package at an affordable price. The performance of the RX-1000 TBR provided to me for evaluation has been outstanding. It has proven accurate and reliable under demanding field conditions. I can recommend it without any reservations. Suggested retail price for the RX-1000 TBR in black/gray is $399.99, while the camo model has a suggested price of $419.99.